Schedule a yoga lesson that is convenient for your schedule! Carrie will guide you through a personalized yoga sequence that fits your needs in this 60 minute session. More times are available than listed on this website. Please inquire! Traditional Hatha based class that moves at a gentle pace and works with basic poses that are easily sustained and accessible for all practitioners. Yin is yoga at its coolest, deepest, quietest, stillest moments. This class will have you on the floor most of the time, using as many props needed to create as little effort while holding poses. Poses are held for 2-5 minutes allowing joints and fascia to release. This class will complement your Vinyasa practice and will open and release areas in need of more flexibility. How often do you stop, truly relax, and connect with yourself? Restorative yoga is a powerful healing practice that deepens our relationship to stillness and silence. It addresses the issues we store in our tissues and organs, balances the nervous system, and optimizes the overall energy flow. When you are in passive postures supported by props, using no muscular effort, the focus is on relieving the grip of muscular and inner tension. From that more spacious and receptive space, feelings and emotions are allowed to be released. When our body, mind, and spirit come to balance, our life becomes balanced. Relax and nurture your body in a special hour long session designed to nourish the parasympathetic nervous system. Conducted entirely on the floor, students savor a quiet practice, which includes gentle rocking exercises, restorative postures and guided relaxation. 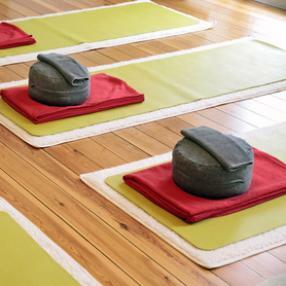 Yoga props, such as bolsters and blankets are used in abundance so that the body receives complete support and can surrender. Restorative Yoga is a therapeutic style of yoga which utilizes props to make it easier for the body to get into certain poses, and thus, surrender to the pose. Practicing poses using props provides a completely supportive environment for total relaxation. The more your body is supported in the poses the deeper the sense of relaxation. Relaxation is a state in which there is no movement, no effort, and the brain is quiet. Typically, Restorative poses are sustained for ten minutes or for as long as you are comfortable. This deep relaxation will help you feel healed and nurtured from within. Combine this with Yin yoga and you get an amazing blissed out practice! This class is held in the non-heated room. Based on the Hatha Yoga tradition, this Restorative class uses postures (asanas) & stretches in combination with the breath to develop strength, ﬂexibility & relaxation to restore connection to the innate energy & power of the body to heal & sustain health. Beginning with the breath to help center ourselves, we will continue warming the body using gentle movements to increase circulation & reactivate dormant energy. A variety of props including bolsters, blocks & belts are available to assist us in creating postures that we will hold long enough to ensure the beneﬁts settle into the body. All levels of experience are welcome! This 75-minute practice is perfect for evening or end-of-week practice so you can completely unwind and de-compress. This practice focuses on calming down the central nervous system and blood pressure. Participants stay in postures from three to five minutes and are encouraged to cultivate stillness when they find their edge. A typical focus can be on opening fascial lines for arms and back body, Props provided.